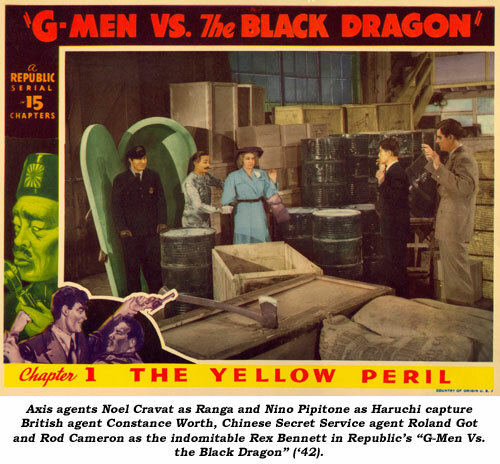 Serial Report Chapter 86-The Green Hornet serials, Hans Schumm, Constance Worth, G-Men Vs. the Black Dragon. 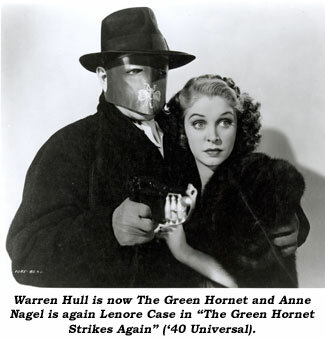 The Green Hornet was one of the earliest superheroes, created by George W. Trendle and Fran Striker along with help from James Jewell, a radio director. He began fighting crime in 1936 as part of numerous radio serials in the ‘30s. 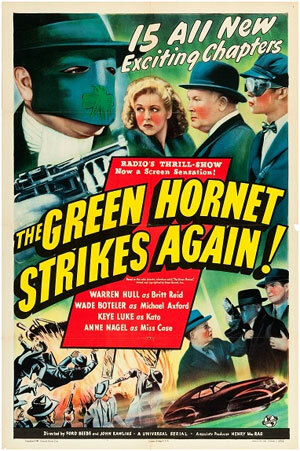 The masked crimefighter made his film debut in the 1939 Universal serial “The Green Hornet”. The 13-chapter black and white serial was told in episodic format rather than a continuous story like most serials. It told the story of newspaper publisher Britt Reid, who becomes the Green Hornet to battle evil, and is joined in this quest by his valet, Kato. 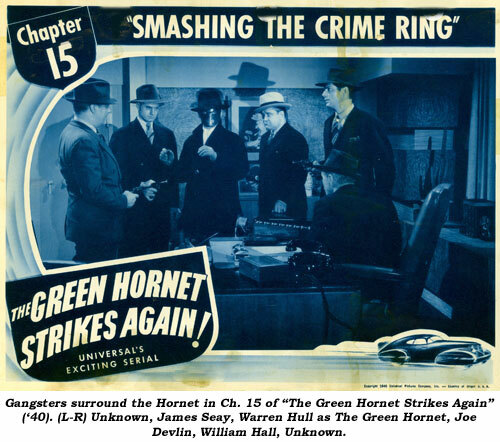 Together they investigate and expose criminal activity, which leads to conflict with the local police who believe that the Green Hornet and Kato are also criminals. The crimes they discover and stop are part of an organization known as the Syndicate, led by the mastermind called, the Chief. 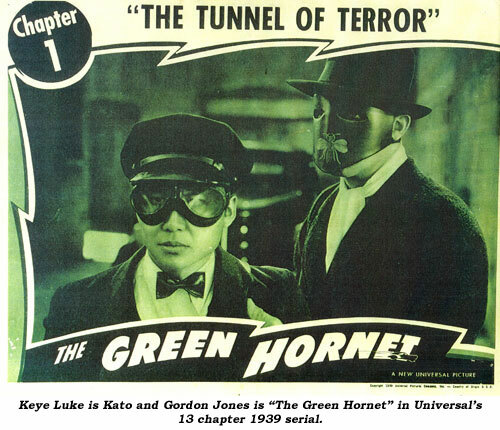 Gordon Jones and Keye Luke starred as Britt Reid/Green Hornet and Kato, respectively. Al Hodge, who played the Green Hornet in the radio show provided the voice for the superhero in the movie. The first serial was directed by Ford Beebe and Ray Taylor and the screenplay was written by George H. Plympton, Basil Dickey, Morrison Wood, and Lyonel Margolies. Green Hornet and Kato returned a year later in “The Green Hornet Strikes Again!”. Similar to the first one, the 15-chapter serial is told in episodic format. In the sequel Reid is a wealthy publisher with Kato still working as his valet and sidekick. The duo battle ruthless Crime Lord Boss Crogan whose power grows every day. He has set up racketeering operations all over the city, all of which have links to strong foreign powers. Given the timeframe of the serial, the threat of foreign violence made the story much more frightening and powerful. 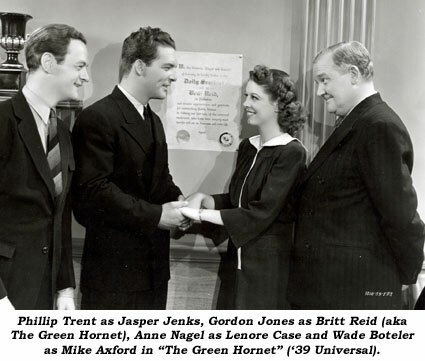 Warren Hull replaced Jones as Reid/Green Hornet and filmmakers used his voice instead of having Hodge reprise the role. Luke, however did return as Kato. The sequel was directed by Beebe and John Rawlins, written by Plympton, Dickey, Sherman L. Lowe, and Fred MacIsaac. The ultimate screen Nazi was Hans Schumm. Born in Stuttgart, Germany, April 2, 1896, Schumm acted on the stage in Europe before emigrating to the U.S. in 1927 where he performed with U.S. touring companies and on the Broadway stage in “The Red Rainbow”. He began film work in 1933 and was well situated when the inevitable calls for German accented actors came to the fore with the onset of WWII. 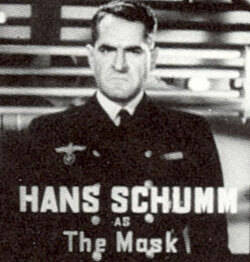 With his piercing eyes and sculpted jawline, Schumm played some of the worst offenders of Nazi atrocities, real or Hollywood-imagined, in films such as “Confessions of a Nazi Spy” (‘39), “Hitler—Beast of Berlin” (‘39), “The Great Dictator” (‘40), “Moon Over Burma” (‘40), “All Through the Night” (‘41), “Berlin Correspondent” (‘42), “Foreign Agent” (‘42), “Margin for Error” (‘43), “Hangmen Also Die” (‘43), “Hitler’s Madman” (‘43), “Sahara” (‘43), “Escape in the Desert” (‘45) and many others—including two serials: “Sea Raiders” (‘41 Universal) as the submarine Captain in Chapters 9, 11, 12 battling the Dead End Kids and especially as Nazi infiltrator The Mask who corresponded visually and aurally with his Gestapo subordinates via transceivers installed in the The Mask’s submarine and at key land-based locations in Republic’s superb “Spy Smasher” (‘42). 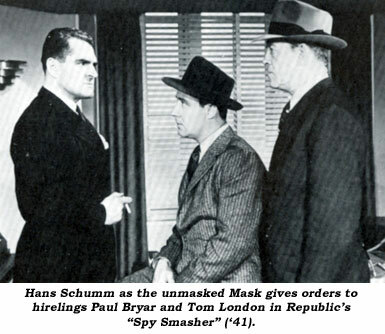 Roles inevitably became scarer after the war (one of his better parts was as a smuggler in the Bowery Boys’ “Smuggler’s Cove” in ‘48) so Schumm often returned to his native Germany. His last movie was the West Germany filmed “Captain Sinbad” in ‘63. Schumm died at 93 on February 2. 1990. He was dead on arrival at Kaiser Permanente Hospital in L.A. from heart failure after being stricken at the Hollywood nursing home where he had been living. His body was cremated with his ashes buried in the actors’ rose garden at Westwood Village Mortuary. 5'5" Constance Worth was born Jocelyn Howarth in Sydney, NSW, Australia in 1912. Gaining success in Oz she was brought to the U.S. by RKO in ‘33 but dropped after two films. She spent three years at Columbia but mostly freelanced in B-films (“Mystery of the White Room”, “Meet Boston Blackie”, “Boston Blackie Goes Hollywood”, “Windjammer”, “Wages of Sin”, “Crime Doctor”, “Dillinger”, etc.). She was British Agent Vivian Marsh, the female lead opposite Rod Cameron as American Agent Rex Bennett in Republic’s “G-Men Vs. the Black Dragon” serial (‘43). She then co-starred in a couple of Charles Starrett Westerns (“Cyclone Prairie Rangers”, “Sagebrush Heroes”). “Western Renegades” with Johnny Mack Brown in ‘49 is her final film. 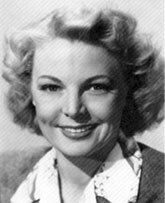 She was briefly married to George Brent, his third of five, from May to December ‘37.